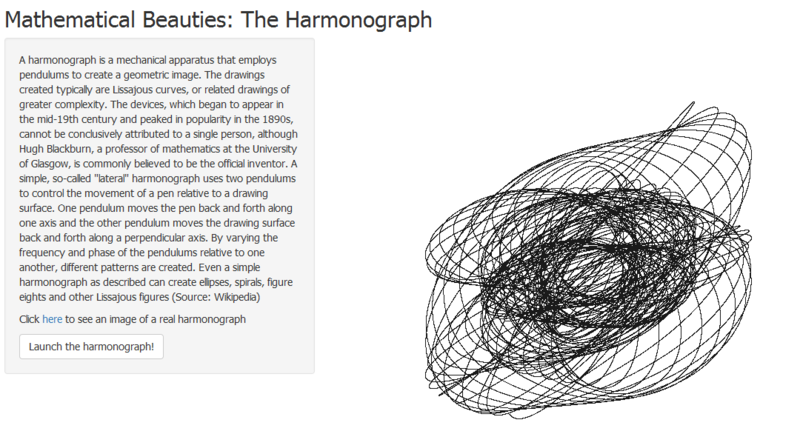 The Harmonograph: This App simulates harmonograph drawings. An harmonograph is a mechanism which draws trajectories by means of two pendulums: one moves a pencil and the other one moves a platform with a piece of paper on it. Click here to try it. 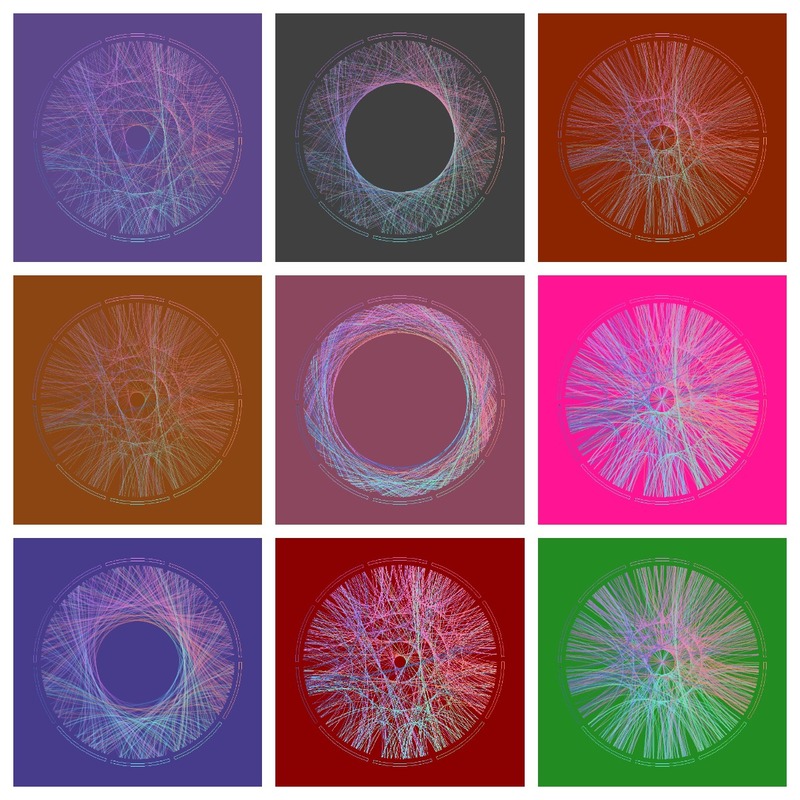 Shiny Wool Skeins: This App, inspired by this post, creates a plot consisting of chords inside a circle . You can change colors as well as the number and quality of the chords. Click here to try it. The Coaster Maker: With this App you can create your own coasters using hypocicloids. Click here to try it. I want to thank to my friend Jorge, without whom I would not have been able to make Shiny work in my server. # run the application by clicking 'Run App' above. attached to a circle, that rolls on the inside of another circle. # application by clicking 'Run App' above. Press the button and you will get a new drawing. Most of them are nice scrawls and from time to time you will obtain beautiful shapely curves. And no more candy words: It is time to complain. I say to RStudio with all due respect, you are very cruel. You let me to deploy my previous app to your server but you suspended it almost immediately for fifteen days due to “exceeded usage hours”. My only option is paying at least $440 per year to upgrade my current plan. I tried the ambrosia for an extremely short time. RStudio: Why don’t you launch a cheaper account? Why don’t you launch a free account with just one perpetual alive app at a time? Why don’t you increase the usage hours threshold? I can help you to calculate the return on investment of these scenarios. Or, Why don’t you make me a gift for my next birthday? I promise to upload a new app per month to promote your stunning tool. Think about it and please let me know your conclusions. # This is the user-interface definition of a Shiny web application. Some time ago I wrote this post to show how my colleague Vu Anh translated into Shiny one of my experiments, opening my eyes to an amazing new world. I am very proud to present you the first Shiny experiment entirely written by me. Those which form a track because they are a set of glued chords; number of tracks and number of chords per track can be selected using Number of track chords and Number of scrawls per track sliders of the app respectively. You can play with the app here. Try Shiny: is very entertaining. A typical Shiny project consists on two files, one to define the user interface (UI.R) and the other to define the back end side (server.R). 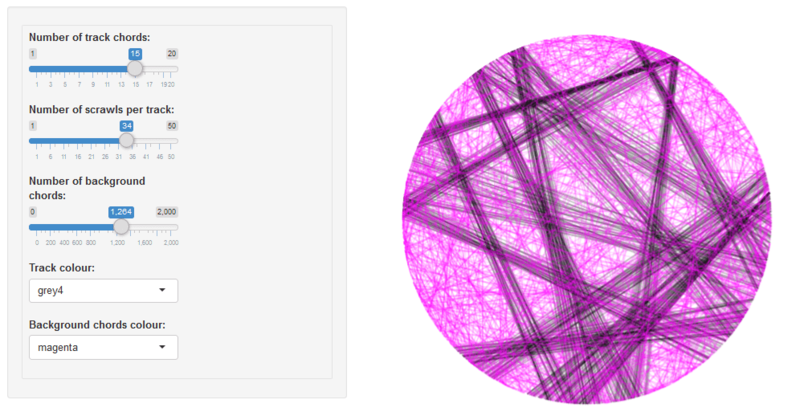 This experiment is based on <a href=\"https://aschinchon.wordpress.com/2015/05/13/bertrand-or-the-importance-of-defining-problems-properly/\">this previous one</a> I did some time ago. It is my second approach to the wonderful world of Shiny. I think the code is a nice example to take the first steps in Shiny. If you are not used to Markdown files, you can follow this instructions to run the code. Vu is a talented guy, who loves maths and programming. He represents the future of our nice profession and I predict a successful future for him. Do not miss his brand new blog. I am sure you will find amazing things there. title: "Maths, Music and Merkbar"